Learning Ally’s Great Reading Games kicks off for thousands of students across the US who read differently. Featuring NYT Best-selling authors Lauren Tarshis and Jeff Kinney. 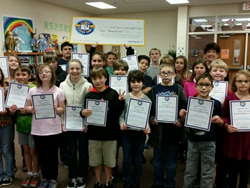 Anne Hooper's class at West Navarre Elementary in FL Celebrate their 2015 Great Reading Games 4th place finish. They read their little hearts out. They are so excited to check the Learning Ally site daily and see what place our school is in. The audiobooks with text on the screen allows students to enjoy reading books above their grade level. This is huge. For the third year in a row, thousands of students in hundreds of schools across the country are competing in national nonprofit Learning Ally’s Great Reading Games, a reading contest. The participating students compete to see who can read the most during the Games, winning prizes and becoming voracious readers in the process, reading daily for at least 20 minutes. What's unique about this event is that all of the participating students have a print reading disability like dyslexia, or blindness/visual impairment, which slows their reading abilities. Traditionally, these same students are left out of book clubs and other mainstream reading programs - which can damage their self-esteem and cause them to fall behind. However, during Learning Ally’s Great Reading Games, these students show that they can overcome their learning disabilities with the right kind of support and inspiration, teachers and technology. They are reading through Learning Ally audiobook technology – which provides students with learning disabilities access to a library of more than 80,000 human-narrated books. They can choose to read titles from textbooks, non-fiction or literature, and download the books directly to their tablets, computers, smartphones, Chromebooks and other devices. Students can read in school, on the go, or anywhere they have a device. Now - The Third Annual Learning Ally Great Reading Games is kicking off, and will run through February 28 culminating on Wednesday, March 2 - Read Across America Day, the birthday of Dr. Seuss – with an exciting national webinar featuring the author of the “I Survived” series, Lauren Tarshis. Additionally, during the Great Reading Games, students, their teachers and parents will be submitting photos, videos, drawings, and other multimedia images as part of a social media challenge tagging Learning Ally and using #GRG17. One student and one school will each win a Chromebook. Schools will submit photos of their bookshelves and classroom reading areas with #BragAboutYourShelf. Students will submit their favorite book quote in a creative way using #Read4All. New York Times bestselling author of Diary of a Wimpy Kid, Jeff Kinney will serve as the judge and select the student winner. Winning schools will receive prizes, including Chromebooks, gift cards, headphones and student prize packs. In addition, honorable mentions will be awarded in several categories. Winning schools, teachers and students will be notified individually and more information will be made available on winners locally. The top 10 schools will be listed on the national leaderboard at LearningAlly.org/GreatReadingGames. Registration for participation in the Great Reading Games is open. To join the competition and to bring the Great Reading Games to your school, speak with a Learning Ally representative by calling 800.221.1098, email programs(at)LearningAlly(dot)org or visit Learning Ally's Educator Portal. To support Learning Ally and programs like the Great Reading Games, funded through the generosity of donors, please visit LearningAlly.org/Get-Involved. Additionally, please listen to the organization's Public Service Announcement. Founded in 1948, Learning Ally supports K-12, college and graduate students, veterans and lifelong learners – all of whom read and learn differently due to dyslexia, blindness or visual impairment, and other disabilities. Through its extensive community events and support programs, Learning Ally enables parents, teachers and specialists to help students thrive and succeed. The organization hosts live and virtual events for families and teachers; provides instructive webinars led by experts as well as peer-to-peer sessions led by students; and professional development workshops for educators. Learning Ally’s collection of over 80,000 human-narrated audio textbooks and literature titles can be downloaded by students using their smartphones and tablets, and is the largest of its kind in the world. As a 501(c)3 nonprofit, Learning Ally is partially funded by grants from state and local education programs, and the generous contributions of individuals, foundations and corporations. For more information, visit http://LearningAlly.org.